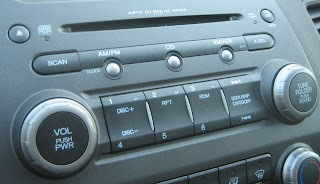 Car Stereo FM1/FM2 - Isn't all FM the same? As I’ve mentioned before, I love my new Honda Civic. But there are still a few design quirks in my car (power windows, keyless entry), and often cars in general, that stubbornly defy logical explanation. Today’s rant: the FM1/FM2 paradigm. Okay, so most car stereos (and I’m talking about the default stuff, not the aftermarket sets) only have six station buttons to keep the dashboard looking nice and clean. And okay, maybe most people want to be able to access more than six preset stations – especially when all of the first six are simultaneously on commercials, which happens more often than any benevolent God would allow. But why, why invoke this FM1/FM2 thing? The artificial distinction of a “different” FM band does more to confuse than to empower the user, as switching between a station on FM1 and a station on FM2 is prohibitively difficult. Just think of the button presses: “uh oh, commercials…” [fm1/2] [preset x] “damn, commercials there too, better switch back” [fm1/2] [fm1/2, if AM is included in the cycle] [preset y]. And keep in mind that that FM1/2 button is often placed as an afterthought, far off from the frequently-used station buttons. That’s a complicated process, daunting dashboard navigation, and a bunch of button presses for someone who’s supposed to be driving! A viable alternative exists, and I’ve seen it in the strangest of places: an old car. In this case I believe it was my uncle’s late-80’s Chrysler New Yorker, or some other now-defunct also-ran, but they got one thing right. There was no FM1/2 button; instead, pressing a station preset button once gave you a station, but pressing it twice quickly gave you a second. Sure, those double-click stations were second class citizens, but certainly no less so than FM2 stations. Reverting back to your primary six stations required no action and no thought at all – just resume hitting station buttons as usual. Best of all, the multiple button presses for the second set of stations were on the same button, so drivers need not be distracted by button-hunting. Tap-tap, done: music to my ears! Excellent idea, my radio has this option, although instead of a double click you HOLD the button for about 2 secs (instead of the usual quick press) to access to second class stations. I couldn't agree more about press-and-hold buttons - they're great, but miserable if there's more than one length of "hold!"